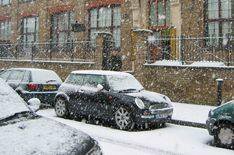 Cold spell signals rise in car crime | What Car? Drivers are being warned that the current cold spell has brought with it an increase in car crime. Numerous cars have been stolen due to owners leaving their cars running and unattended while the windows defrost. The majority of incidents have been in Glasgow, Manchester, Leeds, West Midlands, Northamptonshire and Berkshire. As a result, the Police are recommending that motorists de-ice cars using a scraper rather than risk having their car stolen. The Police have also warned it is an offence to leave a car unattended with the engine running on the public highway. Insurance companies may also decline to pay-out on cars stolen in such circumstances, as leaving a vehicle unattended with the engine running could invalidate the driver's cover.